Squarewave Sound is Salt Lake City’s only store dealing primarily in synthesizers and effects pedals. We are lucky to have them—not because they are the single option, but because of an already intriguing selection of instruments and effects and an owner with a great amount of knowledge and enthusiasm: Philip Zinn makes one’s time spent in the store a memorable and positive experience. My visit to the shop for this interview was my first time being there, and I wanted to play with every machine on the shelf. The shop space is on the smaller side, so there’s a nice sense of being surrounded by gear. Records line the tops of the walls, a chalkboard announces incoming equipment, and a glass case houses effects pedals, some by brands unavailable elsewhere in Salt Lake, such as Strymon. Philip’s interest in synths and modulars began when he was playing bass as a teen in a three-piece rock band. 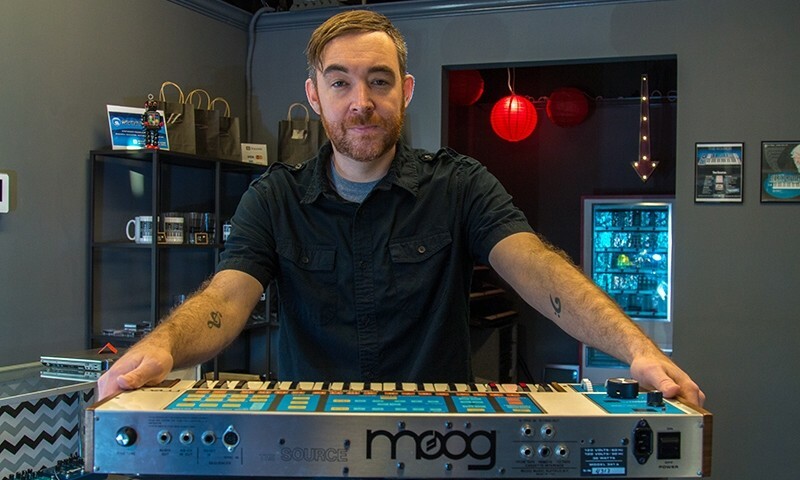 He recalls the experience as fun, but there was a definite turning point at the time of Philip’s discovery of soft-synths in the early 2000s, when he became excited with the idea of being able to perform music alone. Philip made the next logical step and began collecting hardware. Since the search for new gear never ends, he still is collecting. 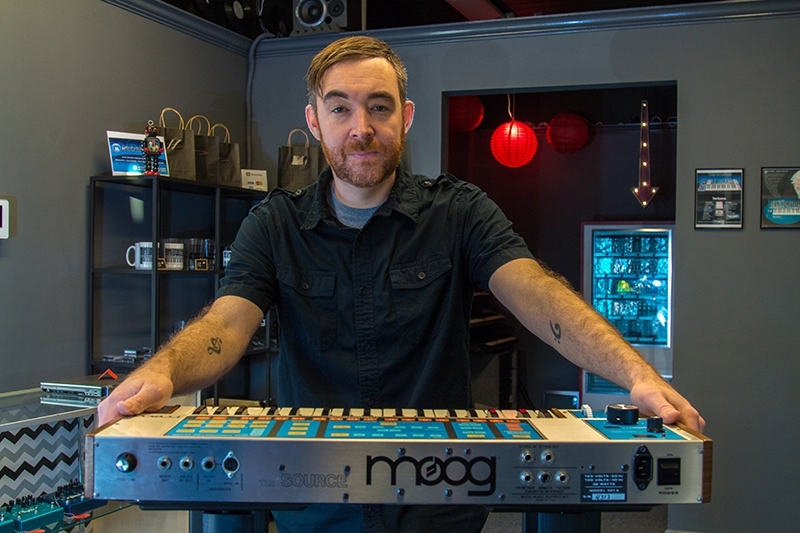 Naming some favorite machines in the shop, he points out a Vermona drum machine in stock that he uses in his own studio, in addition to a few Moog synths, and he is looking to add a Dave Smith Instruments Pro 2 to his setup. 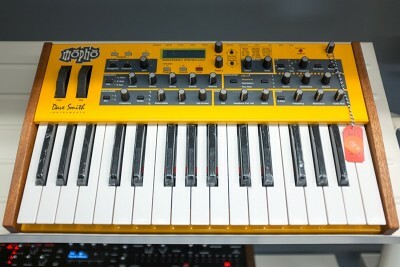 Squarewave Sound offers a range of unique equipment, such as this Dave Smith Mopho. Philip likes to talk to people about their own projects and pursuits, be they dance music producers or keyboardists in rock bands, beginners or electronic veterans. Phil says, “What I really find cool about synths is they find a home in a lot of genres of music. A lot of people maybe don’t think about them in that way, but they’re very versatile instruments.” Refer to music by Clara Rockmore, Suzanne Ciani, The Night Terrors and Dâm-Funk for examples of these instruments’ levels of versatility. Philip cites synth-based music by artists such as Alessandro Cortini and College as current favorites. 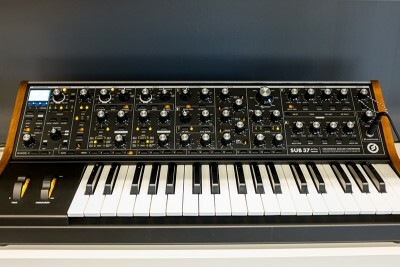 A Sub 37 from synth innovators Moog Music is something you’ll find at Squarewave Sound. Philip lists Analogue Haven, Noisebug, Switched On and Control Voltage as his favorite shops and inspirations for Squarewave. I tell him I’m glad to finally be able to order gear that wasn’t previously available from a local business. The vending machine full of modular units was a pretty intriguing sight. Having played with one for a while after the interview, I’m seriously hoping there will be a Moog Theremini in my future. Philip currently runs Squarewave part-time and says that he hopes to see the store grow to be able to employ others and have regular hours. Though he has retail experience, Squarewave is an entirely new business venture for Philip, guided by his own knowledge and passion about gear. He’s made some fantastic connections, both local and out of state, including SynthArk, of Pocatello, Idaho. Philip says “SynthArk is a small company dedicated to the preservation of vintage synthesizers through restoration and sampling.” SynthArk will also be handling repair work for Squarewave customers. Squarewave Sound will periodically host meet-ups and classes in order to support and help grow the SLC synth community. Philip says, “One class that is upcoming, and that we’re going to try and repeat often, is a ‘Modular 101’ class,” hosted by Lance Iden, owner of Softwire Synthesis, a local Eurorack modular synth manufacturer profiled in SLUG’s 2014 Craft Lake City DIY Fest issue. “Our hope is to make the subject less daunting and more approachable for people.” Philip says. Visit Squarewave Sound Monday through Friday, 4 p.m.–6 p.m., and Saturday, 12 p.m.–4 p.m., at 1321 East 3300 South #9, SLC.